I've learned a few lessons from my chef friends. Number one, it pays to ask questions. Case in point, recently on a trip to Alabama's beautiful coastline, we were debating where to eat dinner. Some of our old standbys have lost their luster. For instance, there are so many Shrimp Basket Restaurants scattered throughout the state, it is hardly a novelty to eat there on our vacation. Not that it isn't good, just that we can eat there in Auburn or Montgomery or Birmingham. It is the same with my favorite Skinny Dip Smoked Tuna Dip. We used to stop by one of the seafood shops on our way to our beach condo to pick up a container to snack on for the week. Now, however, my local grocery store at home sells it and it just isn't as important to buy some at the beach. Remember how exciting it was when we were kids to watch the annual Christmas shows on television? You could only see Rudolph the Red-Nosed Reindeer or Frosty the Snowman at Christmas time. It was so thrilling to count down the days until they came on television. By the time my kids came along, the shows were on dvd, so they lost some of the excitement of WAITING for the shows to come on. Yes, delayed gratification can be a very good thing! It was the same thing with vacations when we were kids. When you traveled, you brought home souvenirs to remind you of your trip and those things made the traveling more exciting. Now, we have internet. You can buy anything online that you could get by traveling, so the souvenirs have kind of lost their pizzazz. Don't get me wrong. I'm all for capitalism and competition and successful entrepreneurship, so I understand why Shrimp Basket is all over the state now and why Skinny Dip is in all the grocery stores. Good for them! I get that, but it doesn't make me look forward to them on my trip to the shore. When I travel, I want local flavor. I love accents, regional cuisines and local customs. I want different, not more of the same. One of the things I worry the most about when I hear the term, globalization, is that we lose the things that make us unique and different. I am afraid the internet and Walmart and fear of diversity are doing that to us. How boring will this world be if everywhere we go we see just more of the same? I love variety, especially when I travel, so I am always on the look out for new and interesting things to see, do and eat. This fish is also marketed and put on menus as Sutchi, Pangasius, River Cobbler, Basa, White Catfish, Tra, Gray Sole, and Swai. This fish is industrially farmed in Vietnam along the Mekong River and thefish farmed there were tested and were found with traces of polychlorinated biphenyls, DDT, metal contaminants, arsenic, and various other chemicals and bacteria. The Mekong River is one of the most polluted rivers on the planet and this is where pangas are farmed and industries along the river dump chemicals and industrial waste directly into it. In the first 6 months of 2013 the U.S. Imported 58 thousand tons of these fish and less than 1% were inspected before being released to sell to the general public. The MSC (Marine Stewardship Council) and the Monterey Bay Aquarium do not recognize this fish as sustainable, even though it is farmed. So I propose this...since it is a catfish why don't you just eat farmed raised U.S. catfish? The U.S. is the biggest producer of farm raised catfish in the world and they are also certified by Monterey Bay Aquarium. Louisiana, Arkansas, Alabama, and Mississippi being the biggest producers. Remember when I said buy and support local in a previous post. Why don't we start regionally? Oh and just to put this out there...7 out of 10 restaurants in Gulf Shores use this fish and have them on their menus labeled as above names or also labeled as "whitefish". Simply put, just because a restaurant is on the Gulf Of Mexico or in Alabama doesn't mean they serve Alabama Gulf Seafood! Once you have listened to chefs with a heart for serving fresh, regional, healthy food, your perspective really changes. Of course, Chef Gibson isn't the only Alabama chef preaching this sermon. Chef Frank Stitt has been teaching the whole state to search out fresh, local ingredients for years. So with this in mind, I picked up the phone. I called a couple of places and here is what I asked. What is your fresh catch tonight? What kind of fish is on your seafood platter? Where is the fish from? I called one restaurant and asked about the fish on the seafood platter and the answer I got was, "some kind of white fish, I don't know what kind". Yikes! On to the next restaurant. Most of the places I called had one, possibly two, fresh catch choices. Usually these included grouper. Grouper is a favorite for many people, but my husband does not happen to be one of those fans. He does, however, love red snapper, when we can find it. Sadly, it has been overfished to the point that it is heavily regulated, so finding it on a menu can be challenging. Wow! That is a lot of choices! A few more questions and we decided to give Big Fish a try. 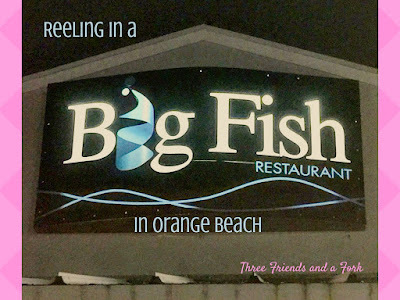 Located in a strip mall across from the original Doc's Seafood Restaurant, Big Fish does not exactly shout, "fine dining". But, we went on in and were pleasantly surprised! Big Fish has a sushi bar. The bar itself was colorful and the health rating was phenomenal! While we didn't order sushi this night, I did see some of the sushi coming out of the kitchen and it looked delicious. After inspecting the menu, we decided to begin with an appetizer of "award winning" ginger glazed shrimp skewers with a refreshing red cabbage salad. While we nibbled on this tasty dish, we studied the menu, found out the Chilean Sea Bass was already gone for the night and both chose the red snapper. I got my red snapper "bronzed", mostly because I liked that word, but also because our server explained it was like blackened, but not as strong. That suited me perfectly, because I have gotten blackened fish before that was so powerful in taste I could not eat it. Bronzed sounded great! My fish came with a salad and two sides. The salad was fresh and crunchy and my sides of sweet potato fries and sautéed spinach were also delicious. Scott's snapper was prepared with an Asian flair. It was sautéed and swimming in a sherry soy broth and topped with ginger and scallions and came with sides of sautéed spinach and jasmine rice. He enjoyed his fish as much as I enjoyed mine. We were fully satisfied when we finished our entrees, but bread pudding was on the menu and it had a caramel sauce. Caramel! How could we not try that? We decided to share a piece of bread pudding bathed in caramel sauce. Heavenly days! It was crazy good. We didn't mean to eat the whole thing, but we did. The next time you visit Alabama's beautiful coast, remember to ask lots of questions and check out Big Fish. 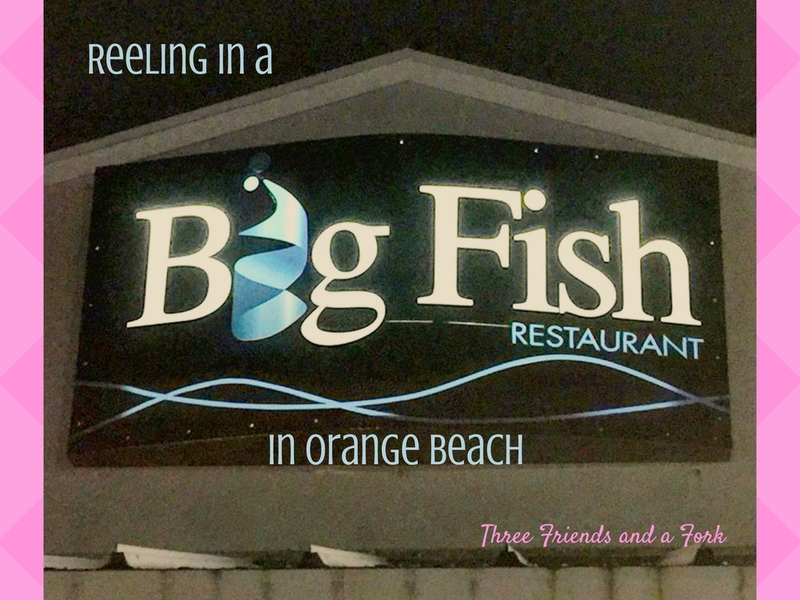 We are happy to give 3 fully informed Yums UP to Big Fish. From the perfect health rating, to the beautiful sushi to the extensive fresh catch list and finally, the divine bread pudding, Big Fish is a big winner!